Discuss liaison and observation aircraft, pilots, squadrons, restorations, and events. I am interested in anything that comes from the 14th Liaison Squadron. I am looking for photos, members families, memorabilia connected with the squadron. The 14th LS was 9th Air Force and attached to Patton's Third Army. The squadron went ashore in France July 7th 1944, and served through the end of the war flying thousands of hours in Stinson L-5's. Thanks to Ryan for putting up this board. Hallo, I am interesting about US Army infantry unit liberated Czechoslovakia in May 1945. 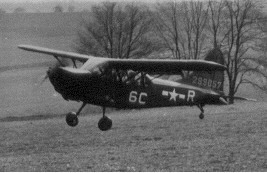 I have photo of L-5 Sentinel No.44-17372 code 6C*R (photo taken by Lt. James W.Hill) propadly of 14th liaison squadron on field close Cheb (during german ocupation named Eger). Please, do you have more informations about this unit. I will welcome change of informations. Are you able to post the picture here? Do you know, please, this for me unknow code? From some local pictures and dokuments I found also unknow unit code 28, 33, 40 and 21 (yet I know, it was code for Artillery section of 8th Armored Div. moved to Czechoslovakia after war on juni 1945). All Divisions have had about 10 planes each, two for Artillery Headquarters Air Section and two for every Artillery Batallion. Purpose and enlistment of 14th Liaison Sq is form me unknow too. I've sent an email to one of our members here that might have the information. Gray of the Sentinel Owners and Pilots Association. not much of a contribution, but I hope it helps. The 14th Liaison Squadron was a XIX tactical air command unit (part of 9th Air Force) and was attached to Third US Army from May 1944 until the end of war. I know one of the pilots from this unit who flew on detached service with the Vth Corps the whole war. The 14th Liaison Squadron sent a 2-3 aircraft detachment, a Dodge WC51/52 loaded with gas cans and 1-2 jeeps with an officer, 2-3 enlisted pilots, a mechanic, and a cook to each of the Corps under 3rd Army. They flew various missions, mostly administrative ones moving around staff officers, but also doing impromptu reconnaissance and often dropping maps to forward units of the Corps. I have not figured out who flew what plane in the squadron except for a few. Thank you for posting the photo.